With over two dozen novels published, in addition to a handful of non-fiction works, Dragon Heart is Holland’s first work of speculative fiction in forty years; her previous effort was Floating Worlds (1976), a story about Martian colonists. 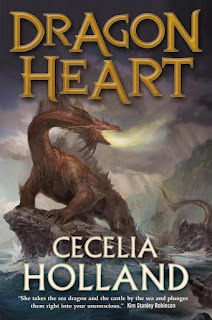 Despite this lapse, which would ordinarily indicate a lengthy work that the author had crafted over ages with conspicuous care and attention, Dragon Heart is both concise and rushed. Jeon is a young prince in an embattled kingdom come to a small cloister to fetch his sister Tirza back for their mother’s wedding; on their way home their ship is wrecked by a dragon and Tirza stolen away. Using her wits, she must charm the dragon to stay alive long enough to escape and find her brother and her way home again. This is also the entirety of the first chapter, and the breakneck pace of the story never lets up once you start. This is a gift and a curse; I couldn’t put the book down once I started, but so much happens that it’s a disorienting experience for the reader. Further, the book contains no maps and minimal references to geography, only place names, so I often had little idea where characters were, how long it took them to travel, or even worse, little indication as to what was happening or even why. I wonder if this is a problem with Holland’s historical novels, but I doubt it: a story located as being “in England” and as “Celts versus Saxons” or “Saxons versus Normans” would provide a load of cultural details, taken for granted, that the reader could sketch in for themselves. Displaced to an original world where the rules are never quite explained (there’s an Empire? and a small kingdom to conquer for… reasons? ), I kept hoping there would be some key to understanding who the many characters were and why they were doing what they were doing. Alas, if there was, I couldn’t find it. By placing so much of the story without context, we have to query what it is that we as readers bring to what we’re reading, how we fill in the blanks of narrative with knowledge that we “know,” or have only learned through reading dozens of other, similar, books. A noble prince saving his sister from a fate worse than death? This is a familiar story, but… is that fate the dragon, or only the life that Tirza leads within the restrictive confines of a brutal patriarchy? Is a prince noble through his birth, or through the decisions he makes? The answers may, or may not, surprise you. I enjoyed this review. It was about the book but also had interesting general observations about stories and genre.